Here you'll find project highlights from some of my clients and creative partners, including print and social media campaigns for Joyland Magazine, Venngage, Schawk, Humble the Poet, 159 Manning, The Parkdale Film & Video Showcase, and many others. Illustration sneaks in, too, especially when it comes to creating original assets. Here, you'll find a motion reel of selected projects including animation, surface design, and illustration. Social media output and motion design for Kellogg's, Post Products, and others. Book jackets, projects, business cards, and company logos. Digital “all-over” illustration for textiles + logos and word-marks for limited fashion pieces. 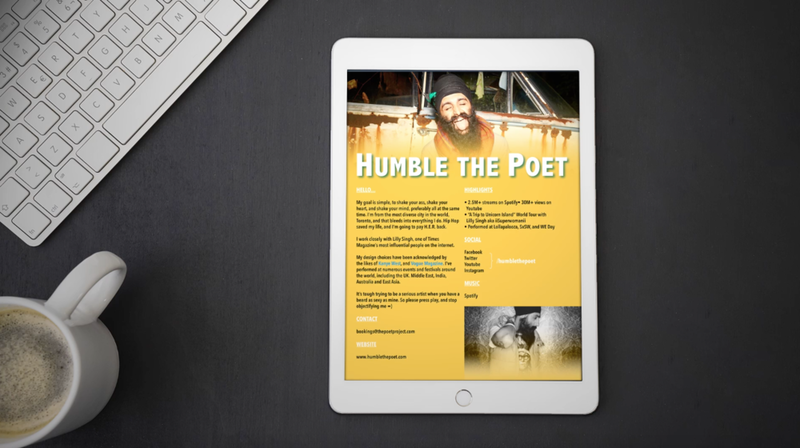 In an on-going partnership, I crafted the web, print, and social media output of Humble the Poet. One-pagers and infographics for marketing campaigns, blogs, and companies. Working closely with Tim McCready and the marketing/events team at the Gladstone Hotel, I developed a comprehensive set of images to promote the multi-level event. Original assets were integrated into video installations in the Melody Bar, with signage and print posters generated for promotion. Magazines, pitches, and non-profit projects, these pieces were created to guide readers or visitors to events and locations. Includes personal project and maps of Toronto, Canada.